Benji B. submitted this photo and caption. 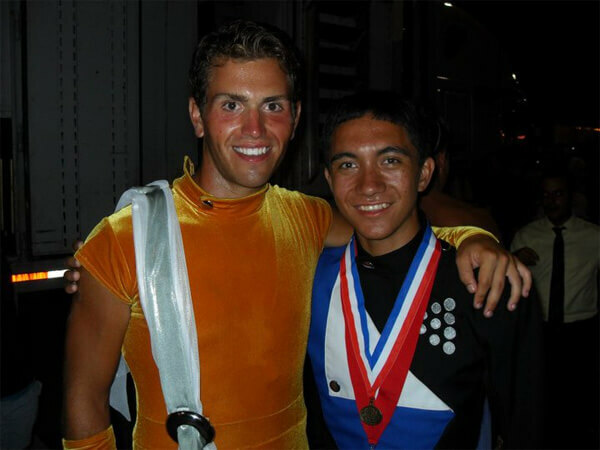 This is a picture of Eric T., Phantom Regiment's 2010 soloist, and me after the World Championship Finals retreat. Eric is a 2007 graduate of my school, Webb City High School in Missouri. The Webb City Cardinal Pride Band was selected to march in the 2010 Tournament of Roses Parade in Pasadena, Calif. Eric was invited back by the band directors to help fill out the parade block, so for the 36-hour bus ride from Missouri to California we were seat partners! The entire trip we could be heard yelling "TRRRRRRROOOOOPPPPPP!!!!" from the back of the bus to our head band director who is a Troopers alum. It was very exciting, eight months later, to meet up again in Indy for DCI World Championships!